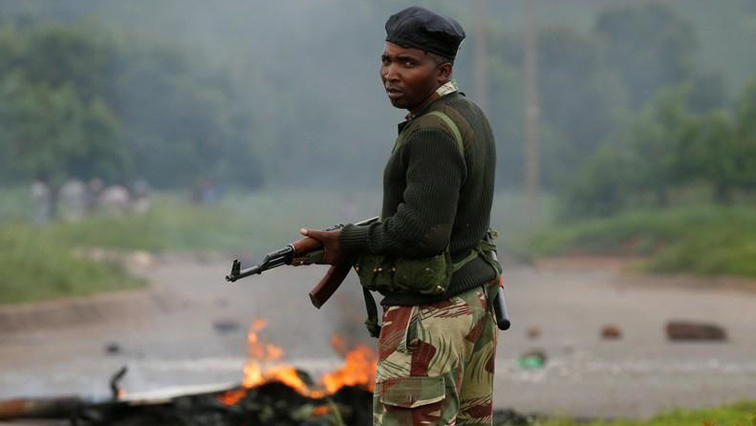 Soldiers patrol Zimbabwe streets after protests kill three people - SABC News - Breaking news, special reports, world, business, sport coverage of all South African current events. Africa's news leader. Security forces were deployed to stave off further demonstrations. Zimbabwe’s military put on a show of force to deter further unrest on Tuesday after at least three deaths in violent protests over steep fuel price hikes but continuing disorder blocked the flow of key supplies into the country. Amnesty International condemned the military crack down, saying at least 200 people had been arbitrarily detained and calling on Zimbabwean authorities to ensure restraint by security forces and respect the public’s right to protest. As security forces faced accusations of heavy-handedness and more protests threatened to break out, Labour Minister Sekai Nzenza announced that public workers would get a monthly supplement of between 5% and 23% of their salaries from January to March while wage negotiations with unions continued. Police spokesperson Charity Charamba told reporters that a police officer was stoned to death by protesters in Zimbabwe’s second city Bulawayo on Monday, while two other people died during protests in Chitungwiza, south of Harare, and Kadoma, west of the capital. Amnesty, in a statement, said the internet was cut off to prevent people from supporting or organizing protests while critics said the government sought to prevent images of its heavy handedness from being broadcast around the world. Reports of violent disorder prompted southern African buslines to suspend services into Zimbabwe, interrupting the flow of goods into Zimbabwe from the diaspora in adjacent countries. This entry was posted on 16 Jan 2019,07:20AM at 7:20 AM and is filed under Africa, Homepage Featured Story Slider. You can follow any responses to this entry through the RSS 2.0 feed. Both comments and pings are currently closed.